Giant insects of the Carboniferous Period! Buffoonish white people! Killing Hitler just for the lulz! 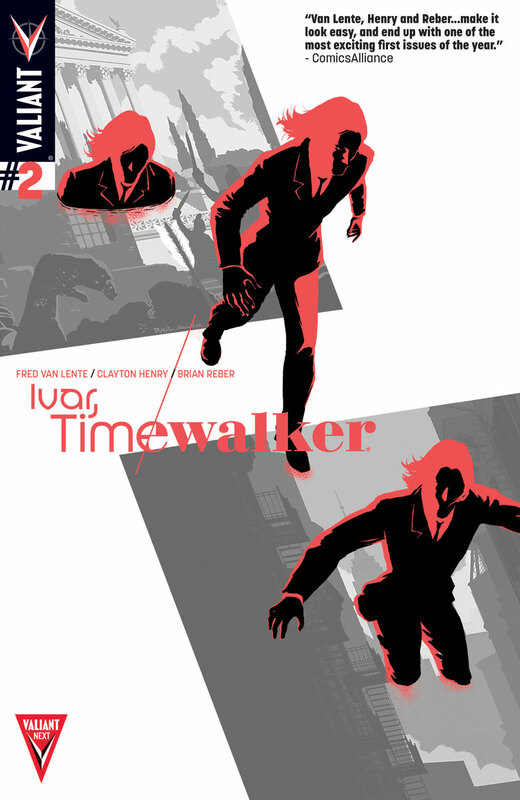 Van Lente, Henry and Reber continue to deliver that perfect blend of science fiction adventure and humor with Ivar, Timewalker #2 and delight in putting on a clinic of how to successfully both show and tell. Loaded with charm, whimsy, good ol’ fashion Nazi-hunting and more time travel technobabble than you can shake an eyeball-filled stick at, this series looks to be shaping into required reading for those looking for pure fun in their comics. Essentially, anyone who isn’t a horrible anon-lurker internet troglodyte from 30,045 A.D. Those guys are the worst. Time-travel stories are always tricky, even when they’re trying to be as laissez-faire as possible about paradoxes and whatnot, because audiences are still going to ask some very basic questions about what the rules are. Because we are all huge nerds, but huge nerds that demand narrative consistency of established laws by golly. Fred Van Lente is tackling this masterfully, balancing Ivar’s dense time travel explanations and anachronistic (meta-chronistic?) history lessons with the occasionally witty and always refreshingly direct exclamations of Neela. Providing just the smallest glimpse at Neela’s personal life (something still in very short supply) Van Lente has her posit a question that leads us on another time-romp with Ivar as a guide to reader and Neela alike, teaching us all about this universe’s rules in the form of…umm…not killing Hitler. Despite the obvious and much-observed Doctor Who comparison, the episodic nature of this series’ thus far is part of its appeal; jumping into a whole new adventure each month in the form of a Magic Schoolbus-esque lesson plan while shooting pirates and/or robots and/or other versions of yourself and/or not Hitler, is beyond fun. There’s still a lot of foundation to lay (mysteries to tease, characters and ideas to introduce, relationships to build, etc) and Neela’s character is in desperate need of some fleshing out as she would appear to have gone all-in on this adventure without raising much concern about her life pre-Ivar. Shouldn’t she be worried about family or be in a greater state of shock or ask more questions? Van Lente does open this issue with a rich piece of back-story about Neela and her character’s personality has been thoroughly established as an intelligent, snarky, proud and capable person thrust into the extraordinary. She is the audience’s representative and will undoubtedly continue to take the mantle as the heart of this story. Additionally, Van Lente is planting seeds of future (I think? Time-relativity terms are tough with this book) conflict between his leads due to withheld information, not the least of which is the form of the person leading the Prometheans’ relentless hunt. Let’s not bury the lede any further, this issue debuts the greatest character ever in the form of the worst character ever, the Lurker. Van Lente, Henry and Reber gave birth to the vilest creature imaginable, as though a 4chan thread gained sentience and the ability to traverse eons, and every single thing about it is hilarious. Eulogizing decency in a blend of internet-speak and with the basest of motivations, the Lurker is the type of light societal commentary that Van Lente excelled at when he was on Archer and Armstrong. God, the Lurker is awful and let’s hope he never goes away. Clayton Henry keeps lockstep with the established light and lively tone and delivers the perfect comedic beats to make this gorgeous looking book a breeze to read and a pleasure to look at. Just like the inaugural issue, there’s some fun design work in the form of various fellow time-jumpers and period-accurate Zelig-generated attire, but Henry’s knack and talent for story pacing steals the show alongside great expression work. Panels flow effortlessly, mimicking the ease at which our adventurers move between literal panels of time, and every joke is realized because of Henry’s ability to manipulate the time between panels and subtle gestures. You’d have to be pretty humorless to not appreciate the vertical five-panel sequence of Ivar trying to convince Neela why she should conceal her true appearance; with a brief moment of silence, a smirk and the gentle flip of a wrist, Henry #nailsit (as the Lurker might say). Robert Gill is credited with the art for the “World War One sequence” and while there is a noticeable change it is thankfully non-disruptive because A) Robert Gill is an excellent artist in his own right and 2) Brian Reber’s colors maintain the visual style perfectly. Honestly, at the particular point in the story you’ll likely be so engrossed on just when the hell someone is going to take a shot at Hitler already, you won’t notice, but Gill does render a more textured, aged Ivar and a detailed battle-weary landscape. Reber’s colors continue to run the gamut around the color wheel, while maintaining the mostly rich saturation that lends itself so well tonally to the book. An opening somber flashback is appropriately more muddied than the vibrant trip fantastic sequence of events that follow and Ivar’s ginger, perfectly sheened red mane always stands in sharp contrast to the surrounding shades. While the bright bursts of electric blues from the arc jumps and magenta-highlighted fire bursts of futuristic weapons clearly provide the pop, Reber also does a stellar job controlling the lighting of various settings the bright midday open streets of Vienna or the moonlit forest outside a Polish bunker really go a long way towards establishing mood. The Valiant Next initiative is rife with exciting, genre-expanding titles from a Universe that was already all over the awesome map and Ivar, Timewalker is looking to make its way to the front of the pack. While still trying to get its footing just right and add just a tinge more character development, Van Lente and co. are ensuring that this book will be a gorgeous looking, smirk-inducing adventure every month. If you’re unfamiliar with Valiant, don’t let that stop you from giving Ivar, Timewalker a try, it’s familiar and fresh at the same time and, importantly, spits in the face of anonymous internet-dwelling haters everywhere.